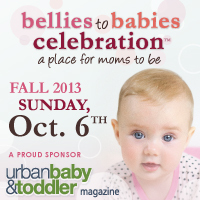 Don’t miss out on the Fall Bellies to Babies Celebration™. BC’s best and original tradeshow for new and expectant parents. Whether you're a rookie or becoming a mom for the second or third time, this day is just for you! Dads and Grandparents welcome too! See everything from stylish baby and children’s clothing; unique, baby gear; skin care; to postnatal classes and green baby products. It's all at one show - under one roof. Moms-to-be can participate in educational workshops. Rookie Dads can take part in our Daddy Diapering Contest. Varied support groups will also be on hand to answer questions for new and expectant parents. Bellies to Babies Celebration™ will feature a wide variety of exhibitors and sponsors, over $3000 in door prizes. The first 100 Moms in attendance receive a complimentary diaper bag. For attending one lucky winner will win the grand prize draw a $1000 shopping spree to Lussobaby. Enter your baby into our Cutest Baby Cover Photo Contest. Your little one could win the opportunity to be featured in an issue of Urbanbaby & Toddler magazine plus win some fantastic prizes. Photos taken on site by Leina Wade Photography. Bellies to Babies Celebration™ takes place on Sunday, October 6th, 2013 at the Croatian Cultural Centre, 3250 Commercial Drive from 11am – 4pm. Admission is by donation to Vancouver Food Bank Basics for Babies Program. Donations include baby food, formula, diapers and baby wipes. Monetary donations also appreciated. Drop off your old or expired car seats at the tradeshow for recycling and help keep car seats out of the landfill. Sponsored by Usedvancouver.com. Bellies to Babies Celebration™ supports "Breastfeeding is Best" and provides a breastfeeding-friendly environment for all. Sponsored by: Urbanbaby & Toddler Magazine, JRFM, Virgin 95.3FM, CTV, Lussobaby, Shop n’ Stroll Fitness, Vancouver 24 Hrs, Yoyomama, Usedvancouver.com, Movies for Mommies. To Attend: Register at www.belliestobabiescelebration.com or call 604-908-8835. Follow us on Facebook at www.facebook.com/BelliestoBabiesCelebration for more ways to win.